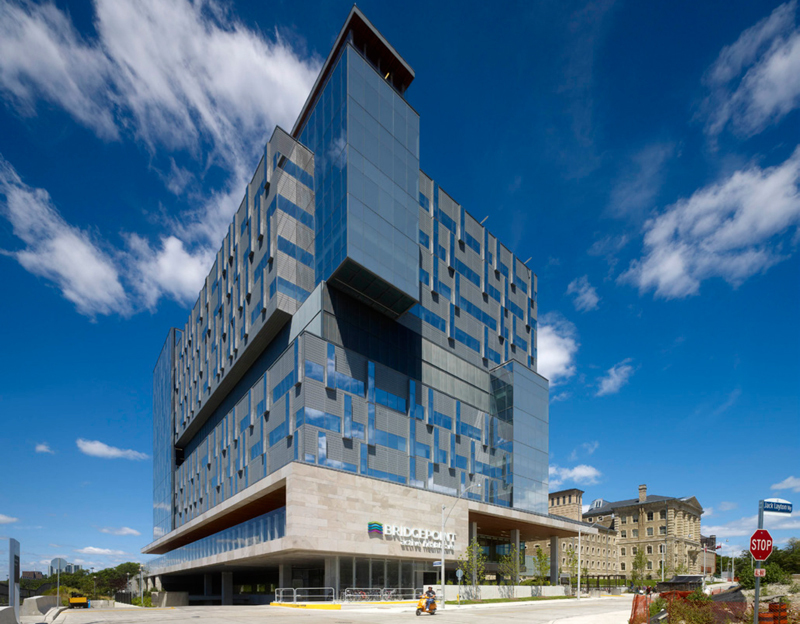 No one driving on the Don Valley Parkway into Toronto's core can miss the brilliant glass edifice that is Bridgepoint Active Healthcare. Opened in 2013, Bridgepoint's state-of-the-art facilities not only provide a high-tech renewal to the former site, they are evidence of something bigger afoot in the landscape of healthcare delivery. From its humble roots, Bridgepoint Active Healthcare is redefining chronic disease management while sponsoring world-class research in the provision of simple solutions to complicated problems. Guiding this transformation is CEO Marian Walsh, a 30-year veteran known across Canada for her visionary leadership, aptitude for innovation and passion for best practices. Providing for the constantly changing needs of patients with long-standing and complex needs, Marian has a diverse career in acute care and academic centres, community programming, professions, associations and governance. She is a familiar face to those at the University of Toronto's Institute of Health Policy, Management and Evaluation. Equally remarkable are her approaches to leadership and sense of humour. HQ's Ken Tremblay caught up with her earlier this year. HQ: You must be happy with your new home and all the changes designed into and supported by that new facility. Any surprises or lessons learned with your new digs? MW: The new Bridgepoint was years in the making. When designing and planning, you're not just imagining the functions within the facility, you're trying to think about your vision, strategy and transformation agenda, to take advantage of a once-in-a-lifetime opportunity to rebuild, not just for care today but the future. There were a lot of things that went into that: ambitions, key design concepts – the things we wanted to do that would transform how we treat and engage patients. At the end of the day, the building exceeded our expectations and that was a surprise. 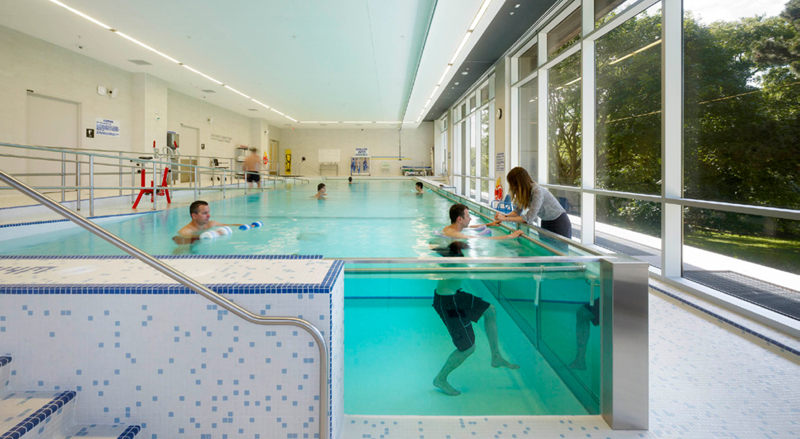 The building really delivers on the vision, provides all the tools, technology and infrastructure we need to deliver good treatment and helps inspire health and wellness. 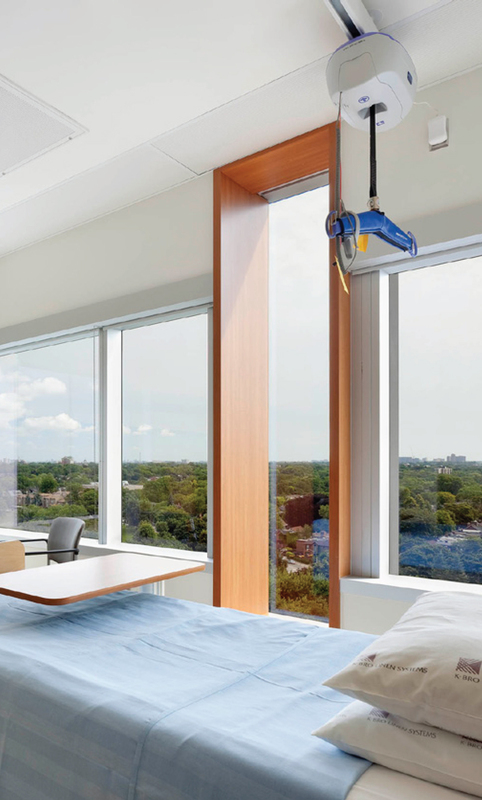 The new hospital takes advantage of the healing benefits of its environment, connectivity to landscape, to community and outside world: letting light and nature penetrate a building that integrates the city and spaces where our staff work. For example, I have had staff say to me: "You know what, Marian, I'm 30% more efficient today than I was last week." That's incredible. We underestimated the impact of new infrastructure and tools on people. We thought about the technology, tools and equipment people need to do their job; when we moved into the new Bridgepoint, every single thing changed: the size of the units, the chairs that people sat on and the technology they were using. That was significant for us. There were surprises about where things were located and workflow: concerned about privacy, we didn't have names on the doors. We needed names on the doors. Way finding was important and we had some access issues for the disabled. We had a major electrical failure in one tower, one day after our official opening, which reinforced the need to practice our emergency codes. HQ: And your administrative offices are in the old Don Jail? MW: Bridgepoint and its predecessors have been on this site for 160 years. The two first public institutions that the city fathers built of any significance were a hospital and hospice to care for the poor and the Don Jail to provide for correctional services (Canada's oldest pre-Confederation building). This site connects the past and the future. We refurbished the old Don Jail to house our administrative and research centres. We have turned a place of incarceration into a place of healing and innovation and we call it the symbolic front door of Bridgepoint. It's a very powerful building with original windows, stone floors, big hallways and corridors that were the day rooms for prisoners. Our offices are along corridors with gorgeous light-drenched windows on one side and cell door archways to our offices on the other. The centre of the building is a spectacular rotunda that reaches from the basement to a skylight at the top of the building, again, to let the light in. This area had been the community gathering space for the prison. And unlike a prison, it is a wonderful, warm and inviting place for us to work in. HQ: Your career is synonymous with challenging models of care, a feature that looms large at Bridgepoint Active Healthcare. What makes care at your place "active"? MW: We changed the brand at Bridgepoint to this "active" moniker as our way of expressing our transformation journey at Bridgepoint. This journey is not just a slogan but describes how we are responding to the new realities for patients, consumers in great need of new models of healthcare, new ways of engaging with them and new ways of organizing our system. We've entered a new frontier of healthcare at Bridgepoint. There's a lot of talk about the 1% of patients who use 35% of all healthcare resources and the 5% who use 68%. We say: look, 60% of the people over 65 have three or more chronic diseases. The success of modern medicine is that people are living longer and, because we diagnose and treat everything, people have higher burdens of complex chronic diseases. We're also learning that the risk factors for any one of these chronic diseases is a risk for the others. Some say that within 10 years, 80% of all deaths will not stem from the sudden onset of disease or trauma; rather, incurable chronic disease that people have been treated for over a long period of time. We shouldn't be closing hospitals that provide care for people with chronic health conditions or needing rehabilitation: that is the growth area for the future. Rather, we should be changing the role of those hospitals and their approaches to care. "Active" is about capturing the idea that instead of saving lives, our role is to actively engage people with chronic and complex illnesses to help people live well with their underlying health conditions. And we think about that as the new frontier of healthcare. Bridgepoint is taking this on as a mission. We are committed to lead this thinking, to do the hard work about what we need to do and the interactions patients need with the system. "Active" healthcare is a new way to change the care we deliver by engaging patients and inter-professional teams in the development of new tools and methods. HQ: You have really put Bridgepoint on the map. What has that been like for you as CEO? MW: This has been a phenomenal stage of my career. I have thoroughly enjoyed the intellectual challenge of transformational change, doing a better job of providing care for this new generation of patients. As well, working in partnership with my colleagues in the complex care and rehabilitation sector to develop views about changing the paradigm: what roles could we play, individually and collectively. To be on the leading edge of the next frontier of healthcare has been fantastic, particularly the luxury of translating the needs of patients into the design and planning for the new Bridgepoint. How do you transform care through buildings and a built environment? Along with working with the city planning and heritage folks, I've enjoyed working on developing academic and research programs. So, this has been fantastic and has brought together so many pieces of my career, enabling me to apply some 30 years of experience to a major transformation project. HQ: A unique feature at Bridgepoint is its Collaboratory for Research and Innovation. How is that effort changing the face of complex care for patients and their families? For example, given your work with colleagues internationally, what findings might be transferable to Ontario? MW: When we built the new hospital, we included the Bridgepoint Collaboratory for Research and Innovation, the world's first research enterprise focused on gaining an understanding about patients with very complex healthcare needs who use all segments of the healthcare system. How did they get there? What were their outcomes? How can we improve knowledge and outcomes? In a seminal piece of research, we looked at these complex patients over a period of time and we uncovered a lot about them. It is a complicated patient population, not homogeneous at all, with multiple concurrent conditions and, often, some untreated, undiagnosed mental health issues such as depression and delirium. Many are on way too many drugs and there's a lot we could do to improve their experience. As well, we're spending a lot of money but not getting great outcomes. As we started our research and published results, we discovered that people in Scotland, New Zealand, Australia, Singapore and Spain were quite interested in this concept of complexity or multi-morbidity. That's enabled us to build coalitions around collaborative research in chronic disease that spans [clinical] settings and countries. This has enabled us to understand and test models, verify evidence and develop treatment guidelines for patients who have not just heart disease but diabetes and arthritis, too, because often their treatments conflict with one another. Our work in a variety of settings has local as well as global impacts. The Collaboratory has focused on the patients themselves. How do they experience the healthcare system? How do care team behaviours affect coordination of care? We're looking at things related to the physical environment: do the design features of our new building actually work to better serve patients? And, we're sharing results with people here and around the world. HQ: Bridgepoint has a project called Integrating Care for Older Adults with Complex Health Needs (iCOACH). If a patient were to stay at your place, how would their experience differ from that of another facility? MW: We're designing [tailored] approaches to care for any patient population living with multiple chronic conditions who are at risk for poor outcomes here or when they leave our hospital. It's an inter-professional team assessment that conducts a deep dive – 360-degree assessment – into all the care needs that people have, given all of their conditions, drugs and all of their care needs: physical, mental and social. Together, we assemble a care plan that deals with all of those factors. Our objective is to simplify what is often really complicated for these patients. We assign them a care navigator and we work with their family physicians and/or care teams in the community. After we address their functional needs for medical care or restorative care in our hospital, we get them organized with the tools, information and coaching they and their family need in order to safely transition back to the community. We then work with their home care and primary care team in the community to co-manage these patients at home with their family doctors. We're coaching patients and their families on goals to support ongoing success at home and partnering with them and primary care providers in the community when they leave Bridgepoint. HQ: Bridgepoint is looking to e-tools to assist patients and providers with care delivery. What have been your early results with e-care when we consider how patients with complex chronic conditions and disabilities might benefit from such investments? MW: It's been fantastic. We're fully set up with tele-health for consults with patients in acute care facilities that are being referred to Bridgepoint. We can talk with the current team over there, get a good understanding of the patient's needs, ensure they're matched with the right programs and start the rehabilitative and/or other care process while they are there. It improves efficiency and eases transfers, referrals and transitions. We can equally consult with the referring specialists and teams through tele-conferencing and digital connections if the patient is moved here but still requires ongoing input and consultation from a sub-specialist in an acute care centre. And then finally, our staff can meet as an inter-professional team with the primary care and/or home care team in the community, electronically, driving huge efficiencies and savings. As well, we can divert patients from the ER or beds at Bridgepoint because we can now offer those skills and services in the community. HQ: Speaking of the community, Bridgepoint is working with family health teams and primary care to assist with clients' transitions back to the community or, as you folks say it, "getting back to your life." Could you tell us how that model is making a difference? MW: We have spent time in the local community working with and gathering up a network of primary care practitioners. We ask them: What can we do to help? How can we help you to better support patients or have the tools and the resources you need to better manage your more complex and palliative patients in the community? Their first response is: "what a relief." Primary care practices are saying with that help they can confidently manage the care of these patients. There are fewer calls and visits to the ER, as they can talk to somebody here first. That reduces the anxiety of family physicians. We're doing a study on this but don't have the full results yet. The other outcome: because we're following patients into the community better, in one year we have reduced the length of stay of patients in our medical care and rehabilitation units by 30%. We're tracking the patients' sense of their preparedness and confidence in returning to the community: the percentage of people saying that they were adequately prepared and supported in the community increased from 65% to the current rate of just over 80%. In July 2014, when we asked about their satisfaction with the care received at Bridgepoint, i.e., would you recommend us as the place to go for people like you, 100% of patients said they would highly recommend Bridgepoint to family and friends. These results demonstrate that the combination of new facilities and transformative models of care are providing real value for people in our system. HQ: Can you tell me more about your relationship with Mount Sinai? How is that corporate relationship affecting clinical care and outcomes at Bridgepoint? MW: For about 8 to 10 years now, we've known that patients with complex conditions don't have care needs that start and stop at Bridgepoint's door. What we both needed was a fully integrated approach to care. Once we opened the new Bridgepoint and Collaborative, we turned our minds to the question: How do we create such an integrated system? Mount Sinai shared our vision to create a model of integrated care in Ontario, particularly a model that would deliver real gains in quality and value for complex patients. We amalgamated our organizations on January 1, 2015, meaning that Mount Sinai Hospital and Bridgepoint Hospital no longer exist as separate corporations; we now operate as Sinai Health System, where Bridgepoint Active Healthcare and Mount Sinai Hospital continue on their respective sites. As part of this continuum of care model, a home care company has joined our network as an affiliate. While not a merger, half the governance structure will be board members from Sinai Health System and we'll work in partnership to create integrated trajectories of care. Our focus will be on certain high-needs populations that will benefit from coordinated and integrated care: from primary care to acute care, complex rehabilitative care, to home care and back to primary care. We're looking at creating end-to-end care pathways, a focus on high-risk populations such as congestive heart failure, COPD, complex orthopaedic issues and some populations with neurological illness and palliative care, etc. The idea is we'll have one care plan for these patients, not fragmented pieces in the community, acute care, complex care: it will be a fully integrated care team across the care continuum. We'll also benefit from highly specialized programs and sub-specialty services that reside in an academic health science centre. We're integrating our research activities and Mount Sinai sponsors great clinical research in aging, geriatrics, etc. By integrating these with our complexity research program, we will create a more comprehensive clinical research unit. We're going to build on the complementary but very different strengths that each of us brings to improve flow, perhaps getting to the point where we don't have handoffs. Our vision: to get to singular care plans, with integrated care teams and health records [to manage] full episodes and bundles of care, for high-risk patients at all ages and stages, from the earliest beginnings of complex diseases to chronic diseases that appear in the mid years and to the end of life. HQ: How should organizations such as yours contribute to the discussion around sustainability of the healthcare system? Where are you making a difference vis-à-vis the health policy debate in Ontario? MW: We really need to think about the outcomes of care for complex patients, emphasis on thinking, not judging. It's not about mortality as in the acute care world; these are different outcomes. Research here is shining new light on how to define and measure the performance of our system, to improve the health status of these complex patients: reducing acute exacerbations, unnecessary visits to the ER for non-urgent problems, readmission rates, etc. Healthcare improvements, health policy and funding will reflect how well we manage or change models of care for people with chronic and complex health issues. Currently, we're working with CIHI on the development of what may become health system performance indicators for the future. Not understanding how we're performing with people at highest risk is a big issue. Evolving from monitoring acute surgical episodes to managing the burden of illness and related utilization is where these patients come in. Bundled payments for quality-based procedures are fine for acute care settings, but you need to change the payment strategy if you're focusing on reducing utilization. Right now, we pay providers by volume; with multiple visits for the same patient, you get paid more. What we'll help answer with HQO, CIHI and others: How should our hospitals be performing and be reimbursed in relation to these patients? What measures can we use to [incent] the behaviours we need and which payment mechanisms would best improve care, outcomes and value for these patients? For example, our physicians and researchers are looking at the benefit of opening five beds for use by primary care physicians to avoid the ED as a means to achieve a rapid response to the patients' needs. We'll be sharing results with government, funders and others so that they can utilize the results of that to inform policy. HQ: You've come a long way in your early roots in healthcare. What do you hope will be your leadership legacy at Bridgepoint Active Healthcare? MW: I hope that my legacy at Bridgepoint will be its transformation. That is the job of leadership in our healthcare system and I guess the legacies we all leave are the changes we needed to make in response to the needs of the people we serve, that you built an organization and a system that sustains them with new DNA. Technology, information and evidence are calling on all of us to keep pace with change, both the capabilities we're developing in our staff and the people we're serving. We exist as a healthcare system to meet the needs of the people in our communities and society. And we have to do a great job with the challenges in front of us: be efficient and pay attention to quality, safety, efficiency and all of that. But that's not enough. Our real value and legacy as leaders will be a system that is standing ready to continuously improve and change in response to the changing needs of people. And remember: it's not about us. In some ways, our system has been built around providers, perhaps because it was necessary to have people come to providers in acute care centres so that we could save their lives; you need to assemble the tools, technology and skills into one place. Now, we have all these people living with chronic diseases and other conditions. That's the new game, as people get most of their care in the community. We have to leave the places we're in and get back to the community. The legacy I hope to leave is: (1) that we have a system that actually works for the care we provide or at least we see an example of one; and (2) we have organizations that buy into the idea that we're here to serve people and that we have to keep changing, learning and evolving in order to do that in ways and models that are not a threat to us. That's how I'd like to be remembered. HQ: Thank you. I enjoyed your commentary, it sounds like an exciting place to be. Great interview. Especially heartened to hear about the affiliation of a home care company with the Sinai Health System. Definitely a step in the right direction. Also I found Marian's comments about the need to reassess payment strategies for healthcare providers to be insightful and honed in on a key problem plaguing our healthcare system.